While today an exchange over these borders is often exclusively equated with the notion of the global jihad, Hopkins and Marsden, with their equally necessary and enlightening fragments on history and modern-day accounts, offer a richer language than the commonly used tropes. Marsden interestingly also once mentions this as a concept of fun – travelling simply for fun. This is a difficult topic to be explained in scholarly language. Oskar Verkaaik, in an another excellent contribution on the migration topic has elaborated on that in his Migrants and Militants which I have reviewed earlier. Some very similar points as Marsden’s are made by Conrad Schetter – see my earlier post here on Trailers and Tractors. 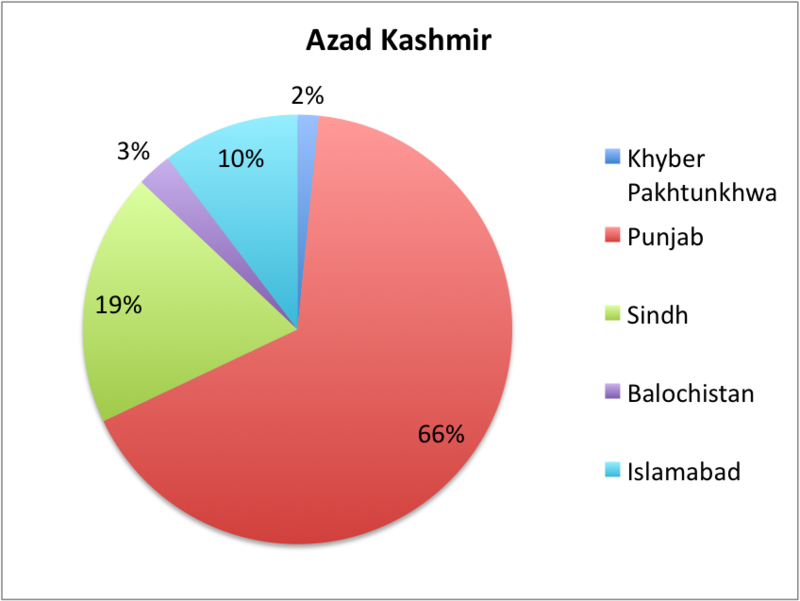 Similar to their approach of telling stories of migration I have recently written down such narratives for theTuqay. Being at it and while we are currently juggling with a lot of Pakistan-data here (some election stuff has already been posted, some more on the war, elections and the census will follow), I looked at available migration data from the Census Bureau and the Statistics Department of the Government, in the end have however for now focused on the earlier set. 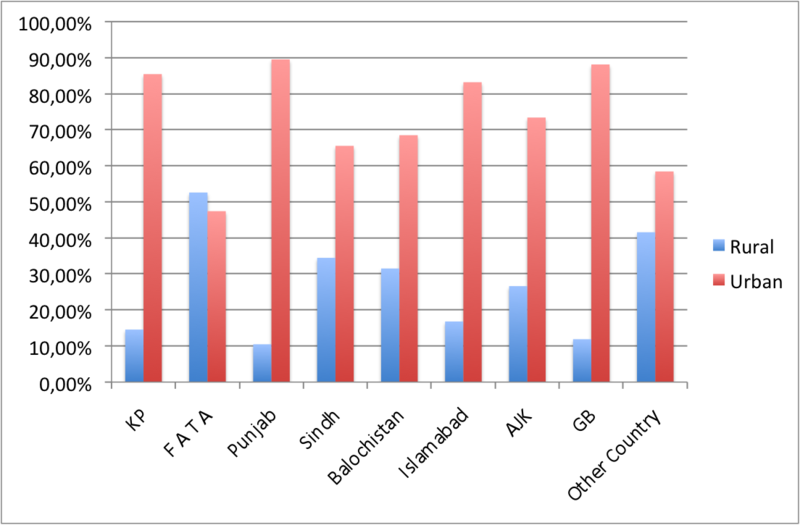 Note that the earlier data are from the 1998 Census – we will compare it to the new census once the data are finally out – and the later from surveys in 2008. Also I will have a seperate post on ‘trust in data’ soon – one can debate the accuracy of the census data and I have already found minor incosistencies, but they should be minor enough to be able to deduct a bigger trend. If you are interested in the raw data, do write an email. The following graphs are all based on the 1998 data from the census and included migrants of all types, whether for economic or other reasons. Total number of migrants who had earlier migrated out of their resepctive province. 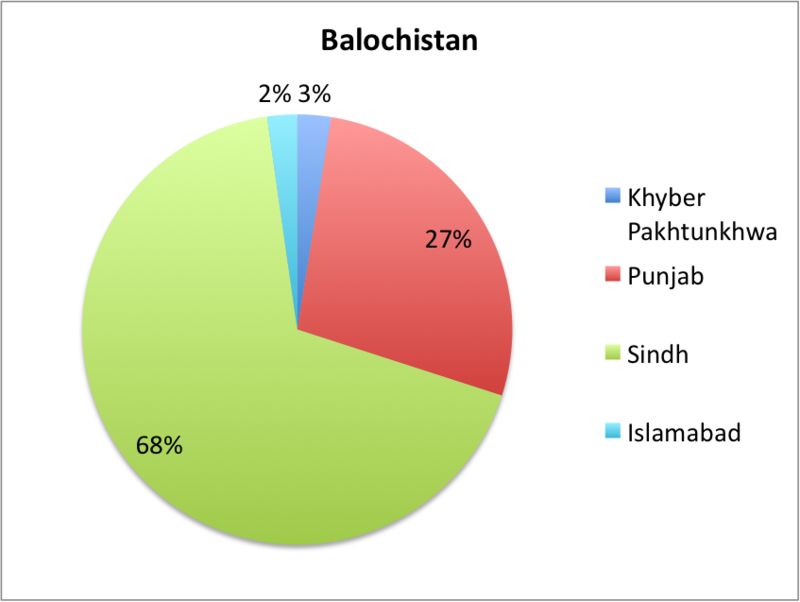 Total number of Migrants who had earlier migrated within their own province. 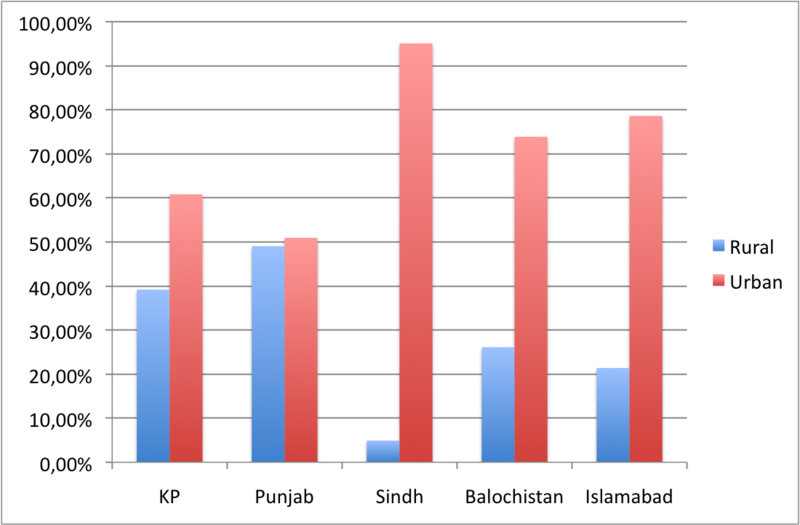 From the below graphs one can see the respective migration fluxes from each province to other provinces (people migrating from title to respective segment). 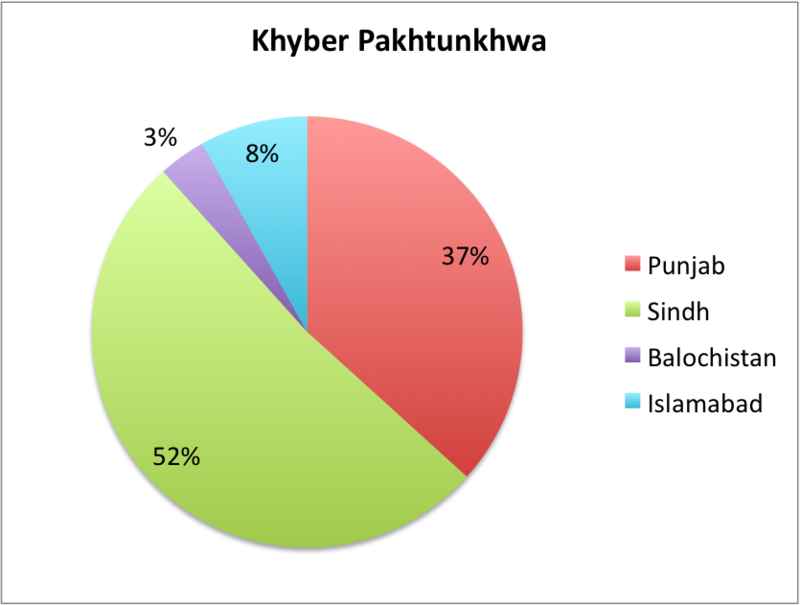 It should be noted that in Punjab 79% of all migrants migrate within the province, in Sindh 74%, in Balochistan 46% and in KP 32%. 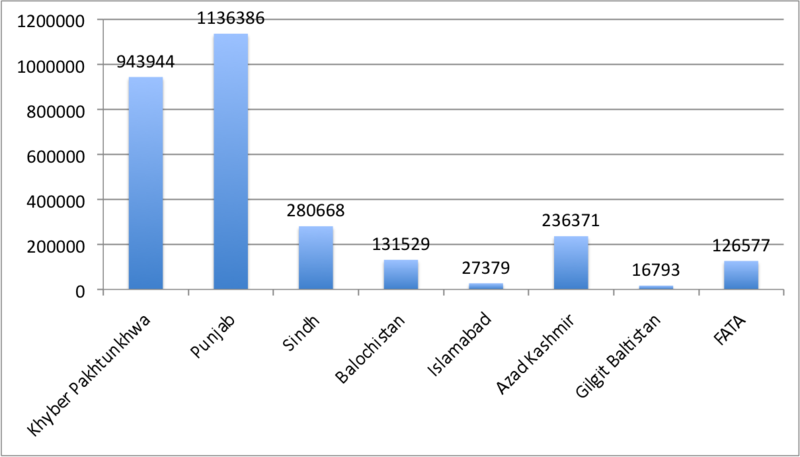 Data how many people migrate within the other provinces is not available. 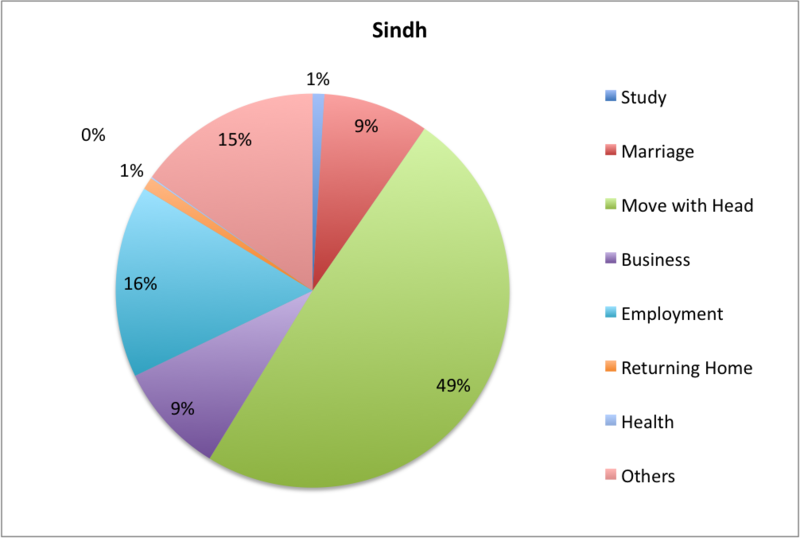 From the following graphs one can see, that most migrants coming to Sindh settle in Karachi, the major reason while the city is probably the fastest growing in the world according to the new Census data. 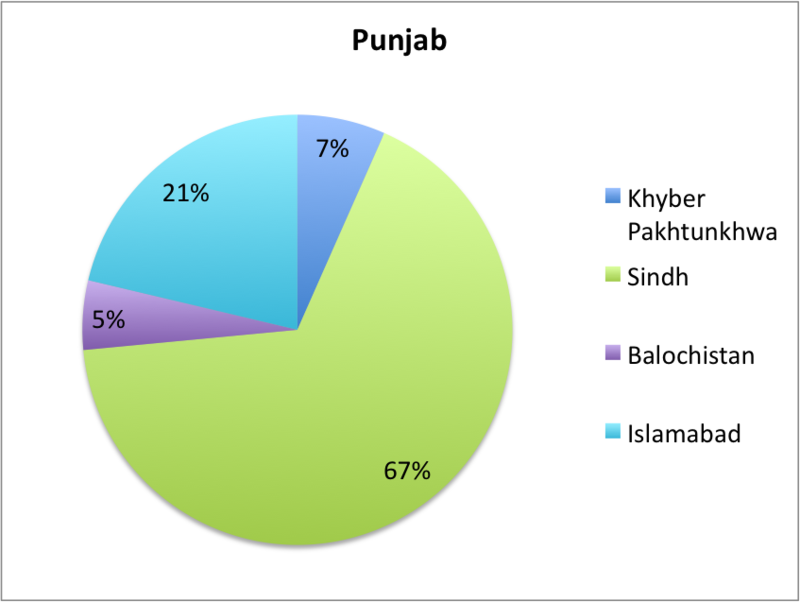 For Punjab, the values are balanced, nearly half move into the countryside. It is further interesting, that while migrants from nearly all provinces move to cities elsewhere, migrants from FATA do settle equally in rural areas in their exile. 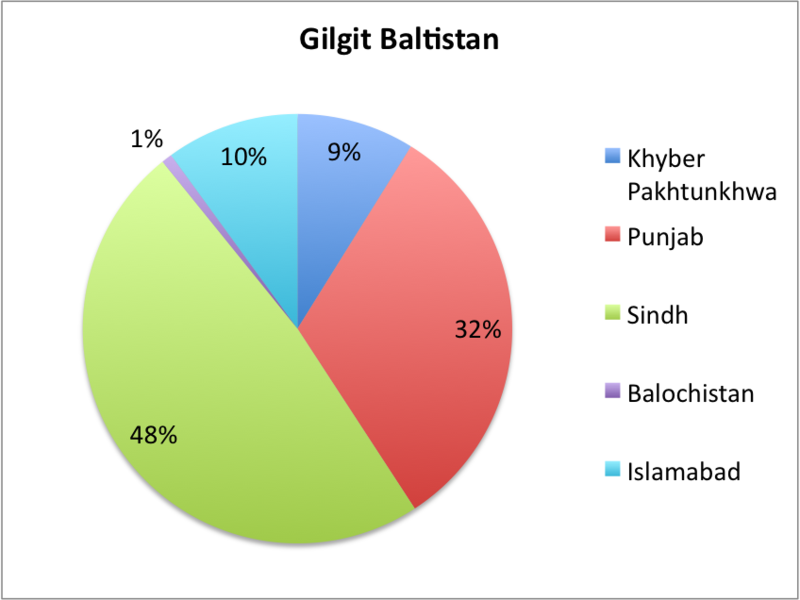 Settlement of migrants within a province (urban or rural). Migrants moving from a respective province to rural or urban areas somewhere else. 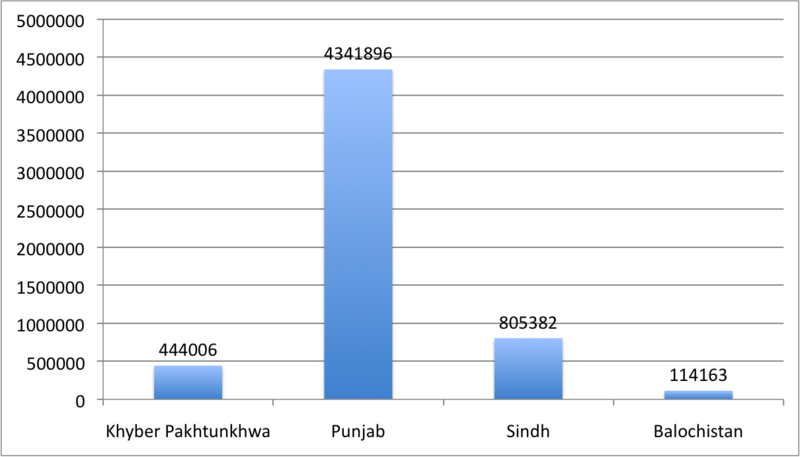 The following graphs show for what reason people moved to a respective province and, for the first graph, in Pakistan in general. The largest chunck is always family moving with a family member who moved for some other reason. 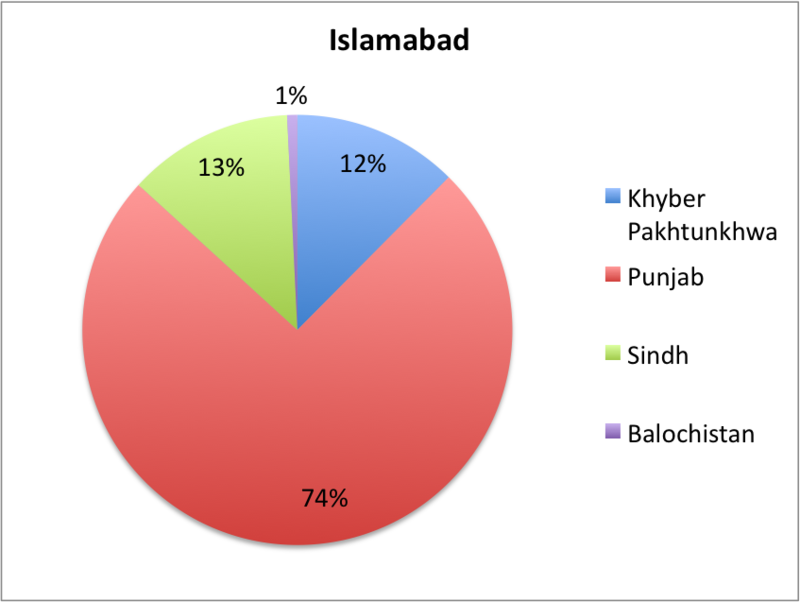 Surprisingly small numbers are given for reason of education, while if you marry to another province it is most likely Punjab. With the data sets from the Labour Force Survey 2008-9 I will look at the respective segments of ‘Employment’ and ‘Business’ at a later stage. 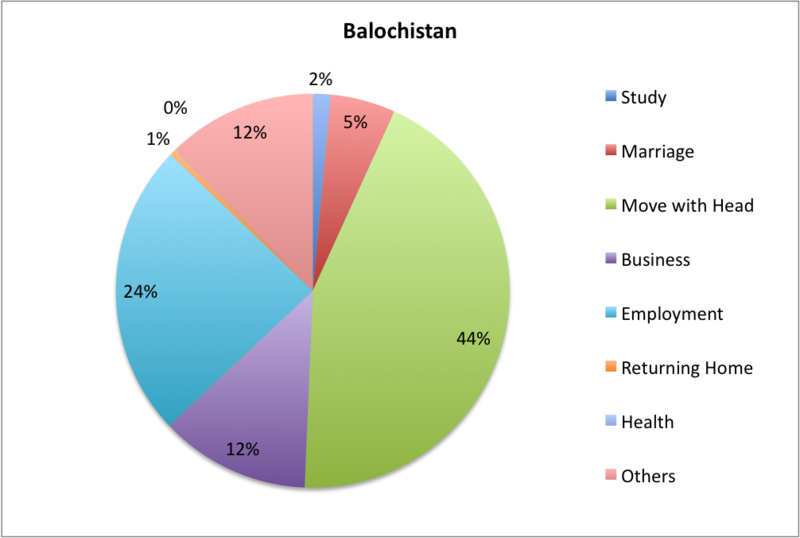 Two interesting papers recently published in this respect are by Arif Hasan and Manzoor Raza on small town migration and by Mahreen Mahmud, Tareena Musaddiq and Farah Said on general statistics. 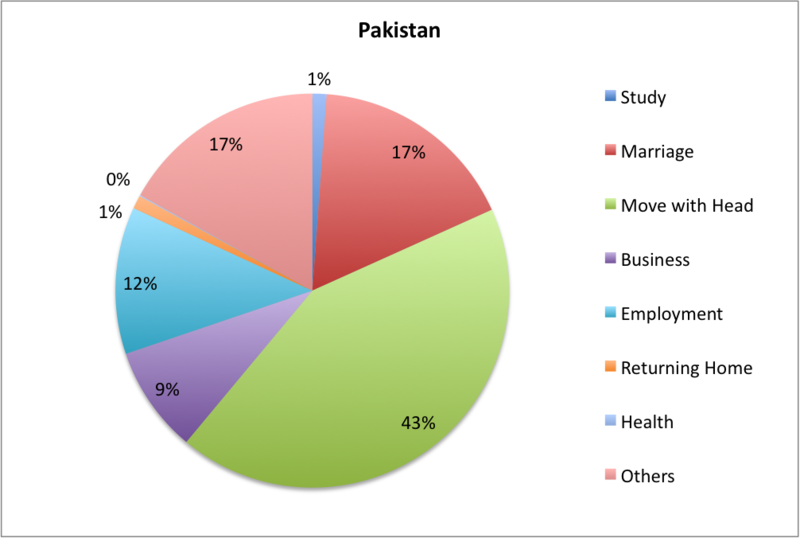 Fantastic comparison on the patterns emerging from migration within various groups in Pakistan. As a whole, I think it gives Pakistan a more cohesive national unity than ‘dangerous source of instability’. it’s a myopic view in my opinion.